Amidst the battle to regain the love of fans for its much-hated redesign, Snapchat seems to be testing a bunch of new features to make it more useful for its users. 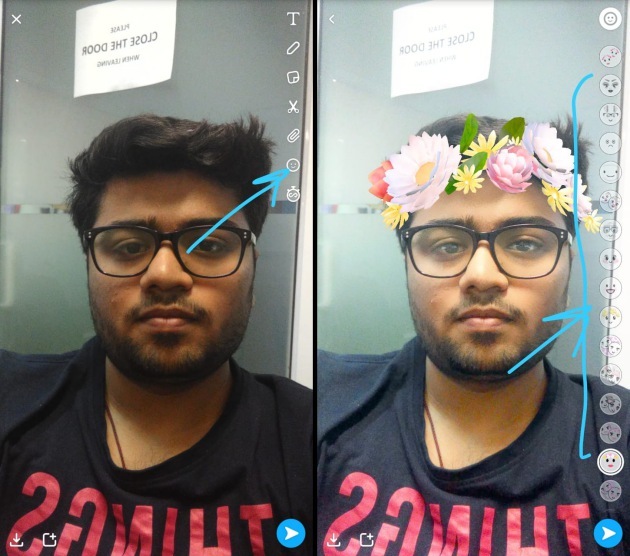 We have discovered that Snapchat now enables you to add face lenses to your selfies after a photo has been clicked. If you’ve ever used Snapchat in your life, you may know that you can simply tap on your face while clicking a selfie to bring up a collection of lenses. You can swipe between them and select any one to accessorize your selfies. 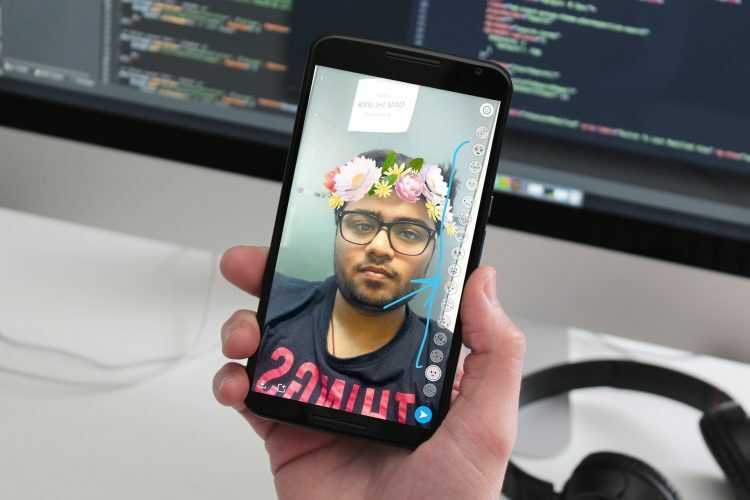 It, however, now seems like Snapchat is using its facial recognition algorithm to provide you the lenses even after the photograph has been clicked. Note: We tried out this feature on Xiaomi Redmi Note 3, running the app’s beta version 10.27.1.0 and Google Pixel 2, running Snapchat’s stable version 10.26.5.0, and it worked perfectly fine both times. As for how the feature works, it’s as simple as using any other image editing tool available within the app. Once you’ve clicked a photograph, Snapchat will show you a ‘Smiley’ icon below the ‘Paperclip’ link icon. Tap it to access the complete range of face lenses and select any of them, be it the infamous dog ears or flower tiara (as yours truly did). It is important to note that the smiley icon will only make an appearance if the app detects your face clearly, and doesn’t show up when only half your face is visible, or for inanimate objects. 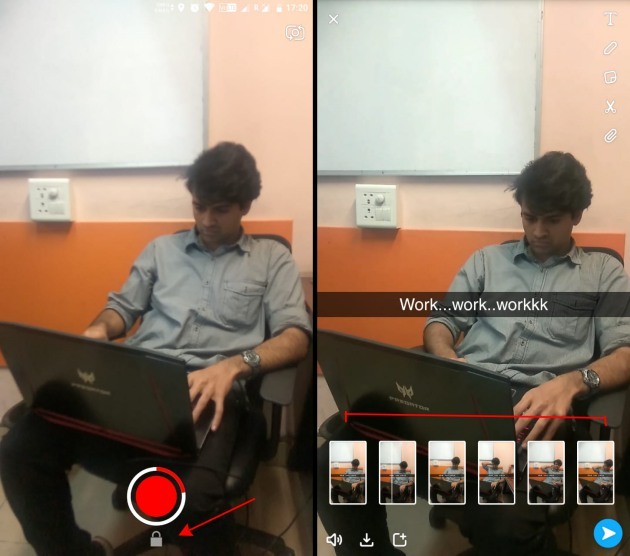 In addition, Snapchat also seems to be testing the hands-free video shooting mode, which was rumoured to be coming earlier this month. Once you start recording a video by long-pressing the camera icon, you can just slide down to a new ‘Lock’ icon and release your finger to shoot a video as you would with the camera app. You can record up to six Snaps, i.e 60 seconds of video, in the hands-free mode. This has been one of the most requested features and Snapchat users will be ecstatic to finally have this feature available to them but still, after Instagram Stories – which has had the hands-free mode from the start. Ever since its redesign and the following backlash, the Snapchat developers team has been operating like clockwork to churn out new features to its ephemeral messaging app. Earlier in the day, we reported that the app is borrowing a page from Instagram Stories’ book and has added the option to ‘mention’ people in its own Stories. So, have you received any of these new features? Tell us in the comments below.